It's a big week for 3DS fans, with the coming weekend bringing North American gamers the New Nintendo 3DS XL and some eagerly anticipated retail games. Beyond the obvious big-hitters there are also some interesting download-only efforts, another classic 3D remaster from Sega and a range of discounts. Without further ado, let's get to the details. Missed the European Nintendo Download Update details earlier in the week. We don't blame you, the schedule was out of whack - never mind, you can catch up right here. Blek (Broken Rules, $5.99) - A rather unique and promising puzzle concept previously released on iOS and Android; the concept is simply to complete and form shapes by drawing lines, but with multiple solutions and a minimalist style this aims to be an immersive, relaxing experience. We'll chill out and let you know what we think in a review. Paparazzi (Pringo Dingo, $4.99) - This looks like a rather quirky indie effort that provides a fast-paced two-player match-up, with one playing as paparazzi on the hunt for snaps and the other a celebrity desperate to escape with their dignity. Jazzy music seems to be the order of the day, with six stages and seven celebrity characters to choose from - we'll get snapping for a review. Available from 17th February. Breath of Fire (Capcom, $7.99) — The Super NES wasn't short of RPG titles, and here's one of Capcom's more prominent efforts from the era; you play as Ryu (and companions) who has the ability to transform into a powerful beast, which must be handy when saving the world. We do feel that this is rather dated compared to its 16-bit contemporaries, a point we explained in our Breath of Fire review. 3D Fantasy Zone (Sega, $5.99) - This iconic scrolling shooter comes in its remastered form thanks to the brilliant work of M2, with upgraded visuals and the now-standard 3D Sega re-release bells and whistles. We'll bring you a review soon. Pong Pong Candy (LIONant, $1.20) - This looks rather like the many gem-based puzzles kicking around on the eShop and smartphones, with this one stating that strategy and levelling up will be vital. We'll get our stylus ready to bring you a review. The Legend of Zelda: Majora's Mask 3D (Nintendo, $39.99) - Heavily in demand ever since The Legend of Zelda: Ocarina of Time 3D arrived on the current-gen portable, we now have its experimental and darker follow-up from the Nintendo 64 era. 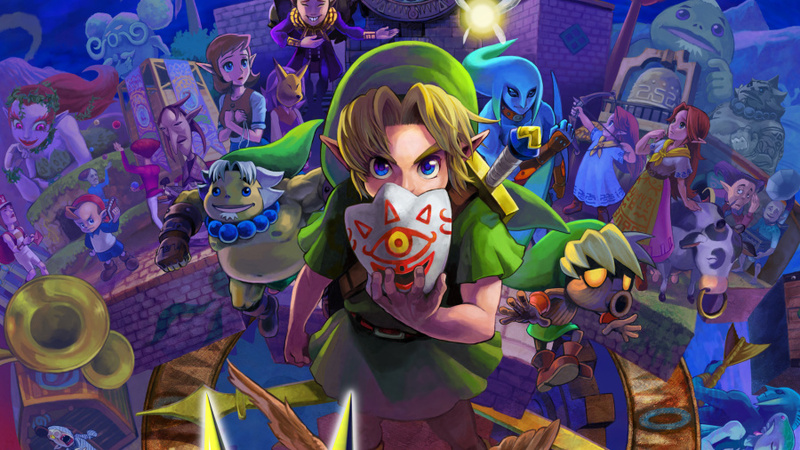 This version brings enhanced visuals and design tweaks to accommodate its new platform, but remains the same engrossing, captivating experience - we feel it's one of the definitive Legend of Zelda titles, and you can read more about it in our The Legend of Zelda: Majora's Mask review. Available from 13th February. Monster Hunter 4 Ultimate (Capcom, $39.99) - Just like its predecessor in the west, this is the second iteration of Capcom's fourth main entry in the series; there are plenty of spin-offs and sub-entries, naturally.It's packed with a huge amount of content, features new weapons, monsters and shakes up gameplay with greater verticality in environments. A huge title in every respect, we gave it a strong recommendation in our Monster Hunter 4 Ultimate review. Ace Combat Assault Horizon Legacy+ (Bandai Namco, $39.99) - Originally released late in the first year of the 3DS, we now have an enhanced version featuring a range of special Nintendo-themed planes that are either found in-game or unlocked at any time with the relevant amiibo toys. We rather enjoyed the original and will bring you a review of this fresh version very soon, but until then you can check out our recent first impressions article. Available from 12th February. That's the line-up for this week in North America. Let us know what you'll be downloading in the comments and poll below. Nothing for me, but I am getting a physical copy of MM3D. majora cant get here fast enough. i doubt ill be getting much sleep tonight. I've got Majora's Mask and a red New 3DS pre-ordered. Time to retire the Ol' blue XL... Can't wait! We finally get Breath of Fire. Now we just need the DK country games and Golden Sun 2 and Ill be happy. I chose Majora's Mask 3D, even though I'm getting the physical copy. :-/ I's dumb. Where's the Ace Combat themes? I don't want to buy the same game again for a full price, but I will gladly buy the themes. @daveh30 My old red 3DS has been through a lot; if any system could ever "deserve" a retirement, it's that one. Tomorrow, it'll be able to! I am the kind of freak that will vote 3D Fantasy Zone before MM or MH. Sega is killing me with its 3DS releases that are not available for Wii U. Hook us up, Sega! Indeed this is an excellent week. Really hoping that I can get my hands on a black new 3ds tomorrow. Breath of Fire, finally. Awesome! I played Breath of Fire II back in the day on SNES, but never got a chance to play the first one. Then we never got it on VC. @Mus1cLov3r likewise! I opted to NOT get the Majora's 3ds just so I wouldn't have to worry too much about ruining it. I'll be getting black and most likely getting a custom vinyl decal of some sort for more personalization. The (red) XL is a beast-- I hope that quality carries over to the new system! Nice to see the free theme if you DL MH4U, I've always viewed themes as something that works better as a bonus than a purchase. Paper Monsters Uncut is a fun little 2D sidescoller for $5, like LBP but w/ proper jumping mechanics. Will the themes be available today, or are they waiting for tomorrow with the game's releases? I can't believe "nothing this week" is winning in a week that sees MH4U and MM3D released. I guess MH4U just isn't that popular and people here don't care that much about remakes, or everyone wants physical copies. So where is Donkey Kong Country Return and Kirby's Return to Dreamland? @sinalefa You're not the only one! Well, when my N3DS XL arrives next week I'll technically be getting MH4U digitally considering it will be pre-installed. Once I complete the system transfer I guess that's what I'll be downloading this week. On a side note, I'm kinda scratching my head over the fact that there's only one Monster Hunter theme. Europe gets both yet North America only one? Since I'm going physical for all the greatness that is the upcoming collectors editions of everything I'm just gonna snatched up fantasy zone and the gold MM theme to match my incoming console! @ted-k I think a lot of those fans are picking up a physical copy. Good, now that the game is out, we can can go back to ignoring Majora's Mask like everyone's been doing for the past 14 years. Wasn't Ace Combat Assault Horizon Legacy+ already released on Wednesday? I'm another person who's picking up a copy of Majora's Mask 3D from retail instead. just the Majora's Mask themes for me due to me getting physical copies of both Majora's Mask and Monster Hunter 4 Ultimate. I thought Dire Moon was supposed to be free if you download the game. No Wii downloadable games again?!? What's the deal? @ted-k For me, I want to get physical copies of those games. Plus, I have tons of 3DS games to catch-up on, so I'm in no hurry to get either game. I was kinda hoping this would be the week where Final Fantasy or Donkey Kong Land finally arrived, but looks like I'll have to wait another week. I will probably get the NES Zelda theme if it looks good. Tomorrow Majoras Mask will finally come. It is on the way via Amazon. @OneBagTravel Just because you don't like something it doesn't give you the right to be pessimistic towards those who do. Control yourself and use your manners next time. Jett Tailfin inches ever closer to an appropriate price. @leo13 NoA thinks we don't need as many old games as Europe. I scoff at Reggie's claim that VC sales are better in America than any other country. Nothing for me this week; although, Blek kind of interests me, but if I wanted to get that, I'd just it on my iPod Touch. I still can't figure out why a re-skinned Ace Combat can sell full price. I'm sure they're banking on the fact most people skipped over it the first time. Stopped in GS for my Shulk amiibo yesterday and tried out the new3DS- simply amazing! The graphics for MM are sharp and clear, the analog nub works excellent, and best of all the 3D effect is spot on- I even tried jerking it left and right but no matter what the 3D effect stayed perfect. Now I'm tempted to swing by GS for the midnight launch event and buy a 2nd new3DS, maybe the red one, and a copy of MM and MH4U- though that would leave me with THREE copies of MH (a second digital with new3DS edition and third with LE game) and THREE copies of MM (2 LE's on the way) , and it would be an extra 3DS. Etrian Odyssey IV Legend of the Titan because Millennium Girl sold me on the franchise. Both are a great deal at 14.99! I'm a big sega/retro classic guy so fantasy zone soon as I get home from work! Cmon sega jump on wii u already!!!! No Iron Fall? Oh well, still picking up MM3D. Would love to pick up Monster Hunter 4 Ultimate, but... I've bought too many amiibos lately. Budgets, man. @allav866 Seriously, I would have bought DKC1, 2, and 3 as well as DKL1, 2, and 3 if they released here in North America. I love me some Donkey Kong. Glad that these were the releases for the week. My HDD died and I cannot replace it anytime soon. With Super Smash installed on the internal memory, I barely have enough room left to do anything. I hope Ace Combat is a huge flop so that Bamco will stop rereleasing the same game on the same system with EXTREMELY minimal changes in order to get the chance to sell it for full price again. Every single change in this plus version could've been added via update to the original release. If it had online play and free flight, then this would've been a different story. I have the Limited Edition MM3D bundle coming, but it's yet to ship. So, I likely won't get that until sometime next week. My guide book had an estimated delivery of the 25th from Amazon. So.. I won't be playing anything this weekend. @ted-k Could be too many are out there buying the new 3DS this week and therefore can't afford anything else. MM coming in the mail. Was hoping we'd get Blaster Master this week. something else to add to the envy list. @leo13 Because Nintendo loves coming up with great services like the VC and then underutilizing them to death. They love teasing in other words. Awful week for the Wii U.
I'm gonna nab me a physical MM3D! Good by world, I will become a hermit come friday with my MH4U N3DS and Majora's Mask. Does anyone know if MH4U will also be available at Midnight? Rats! No Iron Fall... oh well. My N3DS, MM and MH should keep me busy. Plus, I think my wallet just spat at me. It is not pleased with my current frivolous behavior. Anybody know what the MM themes are like? I can't check them right now, but they seem interesting. fantasy zone!!!!!! i am so exited to play it finally!! i want to download it now!! i dont think i can wait another 30 min. or however long it takes until its available. @Amiibo I can't find anything on the eShop, but if going by the eShop launch of MH3U, that wasn't released until Noon of the launch day. A li'l disapointed there's no VC game for 3DS this week, (I'd even be happy for "Mappy-Land") but I am looking forward to "3D Fantasy Zone." Take my money, Sega & M2! I always prefer physical copies over downloads but considering the amount of time that I'm going to pour into MH, downloading may be my best option. @rjejr I agree with you on the themes as bonuses. I'm a bit embarrassed by a store full of $2 jpegs. Also, Paper Monsters looks like LBP a bit, but it is, of course, missing the key feature of LBP which is stage creation, right? Just for clarity. I agree with you on the disappointing jump mechanics in LBP. I always wanted to like that game but found it too frustrating to play, like walking through a ditch full of peanut butter up to my knees. @3DSWiiUFanatic Seconding: an EXCELLENT deal. If you have slight OCD and love RPGs, it's an excellent franchise. @aaronsullivan - "like walking through a ditch full of peanut butter up to my knees." I think somebody's been watching old I Love Lucy reruns at work. Paper Monsters started life as an app - which just didn't work very well even for free - but for $5 it plays better. And I can't even make levels in $60 LBP3 b/c of some glitch that won't let me use anything in create mode. No rewind either. It's been well documented. Multiplayer is still fun w/ the boys but the game is buggy. Paper Monsters I just play for fun some nights after dinner, easy to get thru the levels, hard to get all the stuff, sort of like a platforming Captain Toad. "No no no. You no want DK games, you want everything else under the sun that just a select few are asking for in comparison." 3D Fantasy Zone for this radically crisp little Christmas raisin dooder. Majora's Mask 3D will have to wait. Still need to play through my copy of Ocarina of time 3D! Breath of Fire is actually the SNES version? I thought that couldn't happen because Squaresoft handled localization back in the day. And I actually WANTED the GBA version because the menus are better designed! My backlog is too big right now to justify purchases. I'm not saying that I'll never purchase MM3D or MH4....just not this week. Monster Hunter. MM3D can wait for a bit. Not downloading anything, but I'm getting Majora's Mask at retail as soon as I can. One of the few Zelda's I've never played, can't believe I'm finally going to. Man, I can't even type that w/ a straight face. Still a great series of games though, I played a pretty good 7 part RPG series way back when, and it's one of very few games I let my kids play online. To bad 3 is all glitched up for me. I'm really looking forward to whatever media Molecule does next. BREATH OF FIRE!!!! FINALLY!!!! I am suppppper excited!!!! True but not surprising. Focus is on the New 3DS but I agree other than Smash we need to get something that will entice more people to get one. Zelda and Star Fox will help once they eventually come out. Nothing for me. I have zero interest in MM3D, so. @TerrapinJess But..... you could've bought it for me. You'd think The Legend of Zelda: Majora's Mask: Gold Edition 3DS theme would be free for people who bought the MM limited edition New 3DS XL system. I'm shocked. Majoras Mask seems more in demand than Monster Hunter 4. Its really no big deal I just thought for sure Monster Hunter would blow everything away for today's survey. I guess it just says a lot for the Zelda series. Today I'm getting Fantasy Zone with the last of my Christmas Eshop Cards credit. I had 150.00 in credit and today it will be gone got some good stuff tomorrow my son is picking up Monster Hunter for me on his way home from work. Can't wait! Fantasy Zone maybe. Maybe Blek. Monster Hunter is pre-installed on my inbound New 3DS so, probably Majora's Mask, then Ace Combat, then Fantasy Zone. @King_Stannis or Fire Emblem Sacred Stones? I never thought there would come a day when there's a Zelda release and it's not at the top of my list. This is a testament to the power of Monster Hunter once it gets its talons in you. @iPWNoobs Oh man, I'm jealous of all you have yet to experience. Fire Emblem is a must, and Super Mario 3D Land. Otherwise, your list is a solid start. @ricklongo Awesome! It's like a brand new game for you. I will say its worth the effort collecting all the masks. @3dcaleb Its all I've been playing today! It's great to see people enjoy the classics. Spin the Bottle: Bumpie's Party, reduced just in time for Valentine's Day. Smart. Maybe Fantasy Zone. If I get MM3D this week it'll be at retail. My Majora's Mask has shipped from Amazon. I have to wait until next week for my New 3DS since Best Buy isn't offering store pickup. Jerks! Side note, I'm really glad to see Nintendo updating their themes each week, but some of them seem a bit basic for 2 bucks. I'd totally spring for a Nintendo app that lets us build our own themes by importing jpegs. Still, a solid week! Something for everyone, I hope. Fantasy Zone is so good. The new features add much to the package, as well. Whatever happened to the Nintendo throwback sales? It's like they released games on Club Nintendo and then gave up on the eShop. I'm very disappointed. Paper Monsters Recut just officially got a sale. Seeing as I'm getting Majora's Mash Limited Edition and Monster Hunter as a physical copy, I'm just gonna get one of the MM themes. The Dire Moon plays Song of Healing as the background track! Mark me down for a physical copy of majoras mask. Is Bubble Bobble ever coming out on 3ds? Wow. Only 10% for Fantasy Zone? I expected more votes for this awesome game in Sega and M2's 3D Classics series. Aside from FZ, I also ordered a physical copy of Monster Hunter 4 Ultimate. Shulk Amibo, secod run May 1st at Gamestop. pay instore now and it ships free too. Had to post it. MH4U for me ! Physical version though seeing that best buy is offering 10 bucks off when you purchase it there . @TerrapinJess I'll join in to say that at 14,99$ it's a sweet deal for all the time you'll spend on the game. I just love this franchise. I might get the MH theme since I'm picking up the game tomorrow with my red New 3DS. I want MM too but I'll buy a physical version a bit later. I've got Majora's Mask special edition on preorder and as a general rule, I don't download retail games. So 3D Fantasy Zone it is! Nothing and no retail either. These last 2 yeara, I've hit close to 2500$ in gaming expenses, this year, I'm not interested in much. Outside Zelda and Xenoblade X. Done with VC entirely. I've decided on getting Monster Hunter before I get Majora's Mask. They both look fantastic, but I just have a need right now to go hunt some big game. Getting a digital copy of Monster Hunter. Before I go in a cave (wifi enabled) on a mountain to play it, I must wait for the game to come out on the eShop! Atleast MM3D had a nice midnight launch whereas I am still waiting for Monster Hunter to become purchasable. Another week of nothing but crap for the Wii U console. Uh, where is the Monster Hunter theme? This update indicates that it's available for purchase yet it's completely absent from the theme shop. @TimeGuy Yep I second that. Couldn't find it either. That golden MM theme is pretty sweet though.